Did you hear the latest news? Subscribers to The Gluten Free Insider Newsletter had a sneak peek. Don’t miss out on the news. I am very excited to share with you that I have created the ultimate cookbook. Wait until you hear how it works. This is a 2013 Cookbook Desk Calendar. That means it is a calendar and a cookbook that sits on your desk in the size of a CD case! Each month features a color photo and calendar on the front and an easy recipe on the back. Every recipe is gluten and dairy free plus instructions on how to easily make it Vegetarian, Vegan and Paleo. How cool is that? I don’t know about your family and friends, but mine all have their own dietary needs. My oldest son is a vegetarian but can’t eat soy, my husband eats Paleo, my youngest son thinks the word vegetable is a swear word and for me it’s strictly gluten and dairy free. Having to juggle these needs and not cook 3 or 4 different main dishes for one meal has taught me how to take one recipe and make it work for everyone at the table. This is what I’ve shared with you in the 2013 Cookbook Desk Calendar. Each recipe is coded and noted to make cooking a breeze. I even had my non-cook husband give some a try and he looked like a master chef! Check out the August photograph, that’s his work. Each cookbook calendar comes in a clear case that flips open to sit on your desk or your countertop as you are cooking from the recipe. I know, brilliant right? So much goodness in a CD case the size of your hand. BONUS: Every calendar comes with a special code to a hidden page on The WHOLE Gang website that will include additional recipes, tips, tricks, tools and how to make each recipe suit multiple dietary needs at the same time. That means cook once and everyone eats! 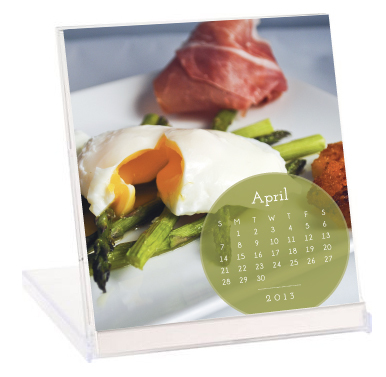 This 2013 Cookbook Desk Calendar is not only great for you, but it makes a great gift for family, friends, teachers, hostesses, co-workers, employees, clients and that person who has everything. Each calendar comes in it’s own gift/shipping box so you’ll be ready to send them out as gifts. If you are giving them as client gifts there is a space in the back for you to place your business card so they’ll know who to thank! Pre-Order Special: I am offering you a special pre-order deal for ordering now. If you order this month you will receive $2 off the list price of $14.95 each. This discount will expire October 31st, 2012. Even bigger savings the more you order. 12 months of great meals! Thank you. I'm really excited about it. I hope others will be too.